As you know, I am now addicted to crochet and had to find an excuse to keep using my hook when I should be making things to sell at the Christmas Fair. So the excuse is: I need to use all the cotton yarn I have left to make things I could sell. Not bad huh? First stop: coasters. 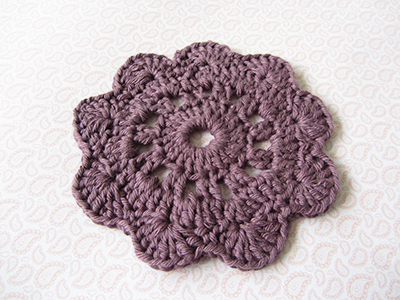 I found several tutorials to crochet flower coasters, I made my own mix and am now crocheting as if there is no tomorrow. I am making them in plum and teal, two of my favourite colours. Yet an other item I won’t sell and keep because I love it too much. Japanese Flower Motif by Would you like yarn with that? These coasters will be my make of November for A make a month. The challenge initiated by the Felt Fairy is hosted by From High in the Sky this month. As usual, I advise you have a look at the Flickr group to see all the lovely things each participant made.